This is not actually a trail, but a very quiet country road through beautiful scenery. We recommend that you drive part of the way and then simply walk along the road and back. The Boskloof valley has the Krakadouw mountains on one side and beautiful valley farmland on the other. At the top of the Pakhuis Pass, there is a small turnoff to the right. Turn off here and park your car in the small car park. Take the trail from here through the gate and continue straight on. 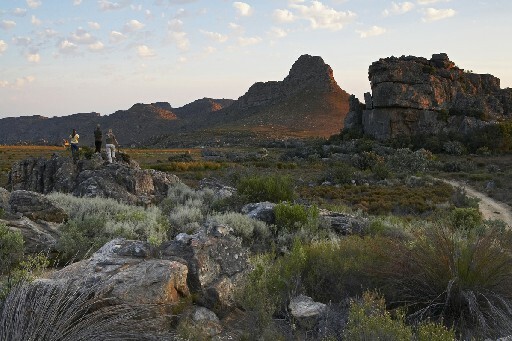 This is a well-marked trail through classic Cedarberg terrain with lovely views down to Karoo on your left. You can walk as far as you want and then turn back. (Eventually you would come to the small community of Heuningvlei after about 12km). 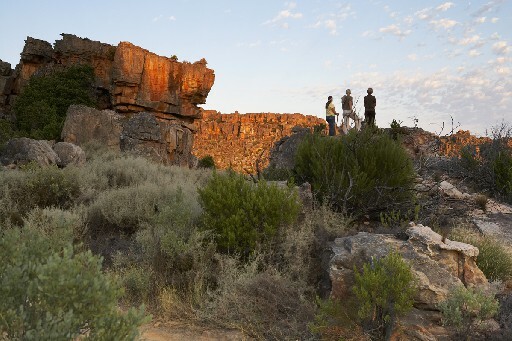 The Sevilla Rock Art Trail is on Travellers Rest farm about 30 minutes drive from Clanwilliam over the Pakhuis Pass. Just before the Pakhuis pass, park your car outside the Kliphuis campsite. 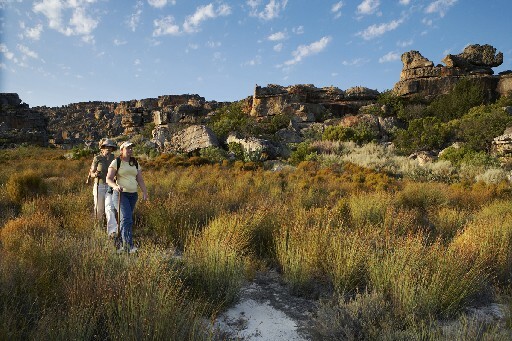 The walk is a 3½ to 4 hour circular walk through pristine Cederberg fynbos. It is relatively gentle (as Cedarberg walks go!) The trail begins behind the old Forestry House and snakes up a kloof for approx 30 minutes. This is the only bit of steep walking. When you reach the top of the kloof, you come out onto a wide broad plateau with views to Kliphuis immediately on the right, the peaks of Faith, Hope and Charity on your far right hand side, and Ribbokberg immediately in front of you. The path veers around to the left. Most of the walk continues on this plateau with gradual ups and downs. The path is clearly marked in most places and there are stone cairns where the trail is over the open rock. Later in the walk, you descend next to a river (Kliphuisrivier), dry in summer, which has lovely waterfalls in winter. At this point, there’s a very pretty view of Lion’s Head, an escarpment of small peaks looking like lions gazing over the plains. Shortly after this the path turns to the left and you round the hill to return to the original valley. After the descent there is a slow gentle uphill section (tiring at this stage in the walk) back to the car park at Kliphuis. This section can be a little boggy in winter. This is a linear walk so ideally you need two cars (or someone who is prepared to walk the additional 3km to retrieve your car from Pakhuis Pass!) Park your car at the top of Pakhuis Pass (see above) and take the Heuningvlei Jeep track as above. After approx 1km, you will see a small cairn and a single file track to the right. (Watch out for this as it’s easy to miss – if you find yourself steadily climbing on the main track, then you have gone too far!) Take this track as it crosses the vlei and then goes gently uphill (after another 1km) on to a second plateau area. Look out for a four way intersection in the trail. Turn right at the intersection and start to descend. It is rocky terrain here. Please be on the lookout for the stone cairns to guide you. You descend until you come to the river/stream. In the winter months you may need to take off your shoes to wade through the stream but in summer, it will be dry. Walk along the other side of the stream to Kliphuis campsite where you will have left one vehicle. Alternatively walk up the road to the summit again to retrieve your parked car. This is not really a full day walk but it does take most of the day as you will need to return – either by donkey cart or by vehicle. At the top of the Pakhuis Pass, there is a small turnoff to the right. Park your car in the small car park. Take the trail from here through the gate and continue straight on. You walk to the small community of Heuningvlei (It is 12km if you take the short cut down the steep concrete path after about 11km. It is 15km if you continue on the path around the vlei to approach the village from the other side). At Heuningvlei, you can either return the way you came, arrange for one of your party to collect you by car or opt to book a lunch and donkey cart ride back to the Pakhuis Pass. Note: There is no shop at Heuningvlei so you will need to take provisions with you. Contact Heuningvlei Tourism for donkey cart bookings - 027 492 3070. 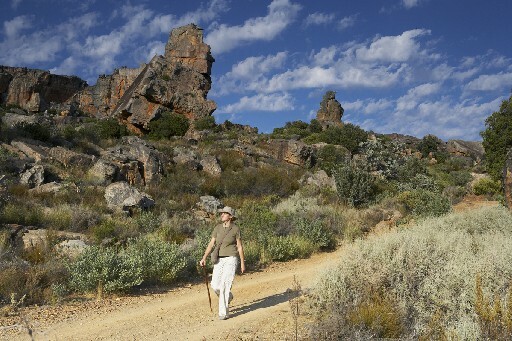 This is one of the finest walks in the northern Cederberg. You leave your car at the top of the Pakhuis Pass at the small car park. Take the trail from here through the gate and continue straight on. After approx 1km, look out for a small cairn and a single file track to the right. Take this track as it crosses the vlei and then goes gently uphill (after another 1km) on to a second plateau area. Look out for a four way intersection in the trail. Turn left at the intersection. Now you start to head down into a beautiful valley. The path is fairly clear but keep a look out for cairns to help you. After a while the steep descent levels off to a flatter section and you cross the river at some stepping stones. Be careful after winter rains! Immediately you have crossed the river, look out for the path through some vegetation on your left. This is the only area which is not clear. Keep left and look for the cairns and soon the path becomes clear again. Next follows a series of uphills and downhills through glorious unspoilt country. Towards the end of the walk, the trail forks. The shorter steeper trail to the right brings you straight down the mountain to just above Krakadouw cottages. Not good if your knees are not strong! The longer trail is to the right. This takes you down more gently and brings you to the Anglo-Boer war block house. You cross the river and turn right at the intersection to pass the block house. Continue on this trail with the river on your right. This is approx 45-60 minutes walk from Krakadouw cottages and so will probably take 45mins longer in total. When you arrive at Krakadouw Cottages, please keep to the left of the vlei and do not approach the farmhouse as it is private property. You can leave your car on the road at the entrance to this farm. This is a great walk BUT you will need either two cars (with one at the end of the walk) or to arrange for someone to collect you. Both Clanwilliam Living Landscapes and Cedarberg Travel can arrange transfers if needed. Permits are available from Kliphuis Campsite (Cape Nature).